The weather may be grim some market days in April and May. Snow and rain are very real weather possibilities. Don’t let this keep you from coming down to market and showing your support for your local food system. Our growing season continues to expand as you vote with your dollars and keep the demand high. So we suggest checking the weather before you head down to market and prepare with following items. Sun – water bottle, sunscreen and a smile cause it’s going to be a beautiful day. Rain – umbrella, rain jacket and waterproof boots, but, hey, water helps those fresh veggies grow so it’s nature’s goodness. Snow – anything and everything warm (parkas, gloves, long-johns and snow boots) if you have the right layers you will be warm! Just like any powder day, bundle up and have fun. Despite the weather our farmers need a place to sell their perishable products. Most farms don’t have access to large storage coolers like grocery stores or restaurants. They mostly need to sell what they have when they have it. Not only do get the freshest, quality food for your all your meals every time you come to market, but you help keep a local farm thriving. 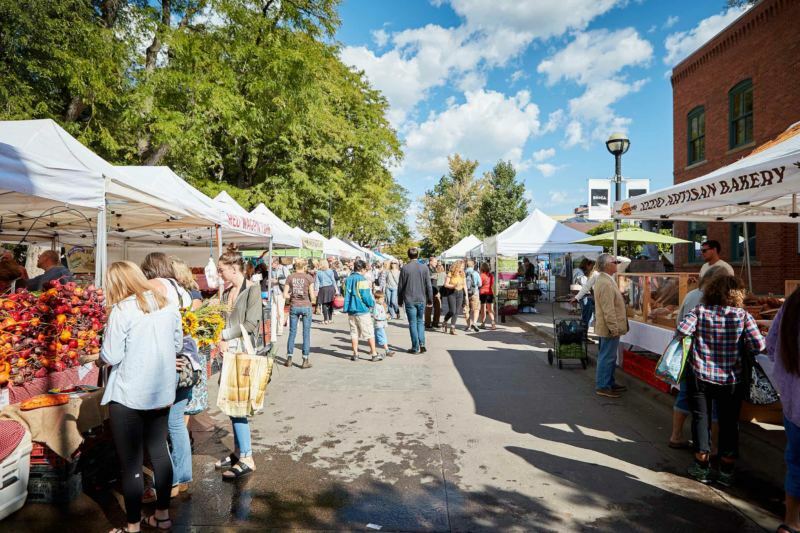 We can’t wait to see you out at market in the rain, shine or snow this season!